So here's the deal. Ever since Pinkerton (or maybe The Green Album) every Weezer fan has asked, "When is the good Weezer coming back?" After three straight sub-par releases, you'd think we'd just give up. Oh, no. We always just think it's going to be the next one. But it happened. Despite its unfortunate name (coined by Dwight from The Office. Really. ), Raditude is really good. Over the years, I've spent more than a healthy amount of time trying to figure out exactly what it was on those first two albums that's Weezer's been missing since. The easy target is always the lyrics. Sure, Pinkerton had plenty of awesomely introspective moments, but really Rivers Cuomo has always written boppy, non-serious tunes. The bigger problem has been the music. The Green Album was solid start to finish. But it was like Cuomo had taken all the heart out of the songs. Just simple, straight forward chords, and catchy choruses. But no personality. Nothing that made the songs uniquely Weezer. It's gotten worse ever since. 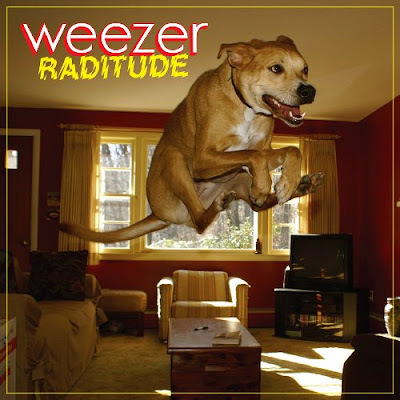 Raditude is still a far cry from their first two records, but the songs are really solid. (The only dud is the bunch is "In the Mall.") They do a great job of mixing things up--hip hop, Bollywood, The Cars--even if they're all just standard pop songs. So, the old days are gone. But Good songs are good songs. Weezer fans have stuck around because all of their records have at least had a few of 'em. Fortunately, we finally got record full of 'em. Hooray.